Do you like Asian food? We love to eat Asian food and I'm always trying to find new Asian recipes to cook my family. We love Thai food! Being said, you would think that I cook a lot of Thai. Well that is not the case. If we want Thai, we head out 25 minutes to our favorite and only Thai restaurant in our area. I always order the same menu item because we only go there on average every 6 weeks and I LOVE their Shrimp and Chicken Pan Woodsen. Lately, I've given in to our need to eat Thai more than every 6 weeks and have found myself experimenting with Thai recipes. I found a recipe and played around with it to created a very flavorful dish that the entire family loved! Do you have an Thai favorites? If so, please share in the comments so that I can come over and check out your recipe. 1) Crush/chop garlic and chili peppers and toss in hot oil for just a few seconds. 2) Add in cooked rice and stir for 1 minute. 3) Add in Oyster sauce and sugar. Stir into well covered. 4) Keep this on high heat and keep flipping/tossing! You don't want the rice to stick and burn. 5) Once rice is all coated with the sauce, add in bell pepper for 2-3 minutes. 6) Toss in basil and cilantro. Mix in quickly and take off the heat and eat! Serve with sliced cucumbers and limes! Squeeze lime on your meal right before eating! This works best if the rice is not freshly made. Make the rice in the morning and just let it sit out on a platter for a few hours to dry a little. This is a perfect dish if you have left over rice from the day before. You have to use Jasmine Rice if you want a good Thai dish, in my opinion. The long grain holds up, it isn't sticky or pasty and is super easy to cook! Follow the direction on the bag. It isn't instant rice so it will take 15 minutes to cook and well worth it. You can cook it in a rice steamer. Follow package or machine directions. I always thought I needed one until I started making this rice. I no longer need a rice cooker. This dish is good with chicken, beef or shrimp. Just toss the meat in before the rice, cook until almost done and then continue with the steps with adding rice. We served ours with Chicken Teriyaki-ish which was amazing together! 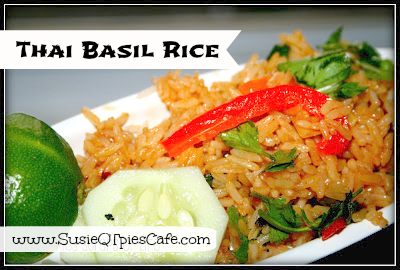 The Thai Basil Fried Rice sounds soooo good! I printed it and can't wait to try it. Thanks for sharing! Yes I do use either one, as well!